Steam or boil the sweet potatoes allow to cool Preheat oven to 180c and Mix all ingredients except fetta , tomatoes, basil and pasta sauce ..
Knead well for approx 3 mins , allow to rest for up to an hour in warm area ..
Spray olive oil onto pizza trays and roll the dough , use fingers to stretch out to form shape ..
Place into hot oven for approx 20 mins , remove from oven and top with crumble feta and fresh basil. This was delicious. Thanks for sharing. We added a few more toppings to suit each family member. Interesting and a good use for sweet potatoes. So handy for my daughter as she loves pizza but find making GF ones a problem at times. This pizza looks and sounds delicious I will definitely try this pizza on the weekend. My children will like all of the ingredients on it so it should be a hit! I can’t wait to try and make this base/pizza; looks wonderfully delicious. 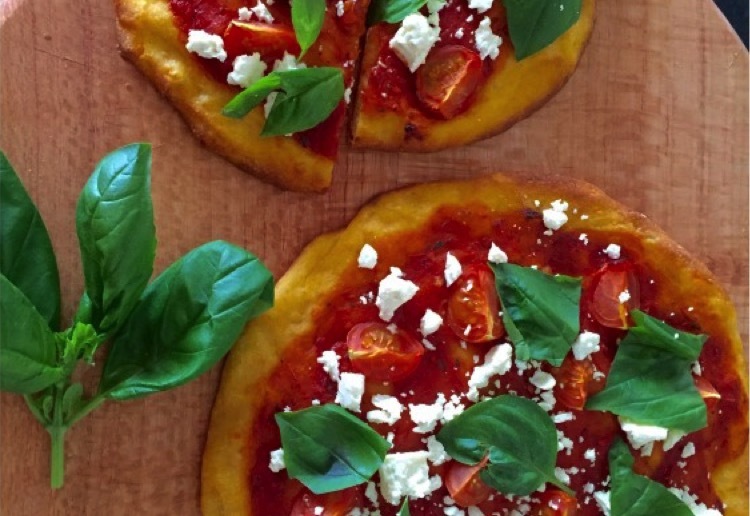 A healthier alternative to home made pizza bases! I love this! Thanks for sharing! Thanks for sharing a unique base and quite healthy as well. What a unique pizza base! This is great! Thanks for sharing! I didn’t know what FODMAP meant until now so thank you for educating me as well as presenting a delicious pizza. Interested to try this. Yum! A tasty and tempting looking pizza – good ingredients in this pizza. I will – I always make and taste the recipes that I love. A delicious vegetarian pizza,it look’s fantastic!